I am a huge fan of Lauren Oliver, so I couldn’t wait to get my hands on Panic. 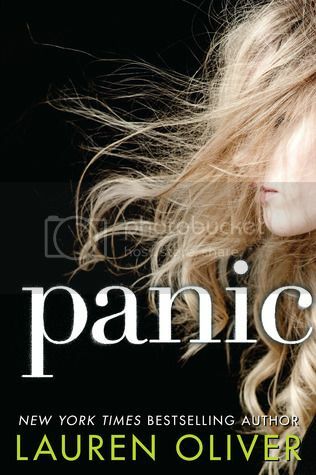 After adoring Oliver’s Delirium series -- a series based on love being a disease -- I was looking forward to starting Panic, which is more a book about danger and fear. Panic is a game based on fears, played by graduating high school seniors for the ultimate prize, a huge payoff for the winner. To continue playing in the game, you must pass the challenges that a group of judges give you. If you fail these challenges, you are out of the game for good. Heather is not the type of girl that would participate in Panic. But after being dumped by her boyfriend, she figures she has nothing to lose. Dodge has a secret, and that secret is what is going to get him through to the end of the game. Both of these players are determined to win the game, and at times they must even rely on each other. But will that be enough for either of them to win the game? Heather was quite an interesting character. If it hadn’t been for her boyfriend breaking up with her, she probably wouldn’t have even entered the game. But once she started playing, and realized that winning would change her life for the better, she played with a vengeance. Who could blame her, really? She didn’t have the best of life, or the best of parents. She wanted better for herself. Seriously, no one can blame her for that. I found her to be a very and determined character. While she didn’t always make the best of decisions, she was still very determined, and she played to win. Dodge had his reasons for playing the game, and they mostly revolved around revenge. His situation definitely wasn’t the best either. (While I’m thinking of it, it seems that most of the main characters in the novel didn’t have very great situations. All of these kids had some problems or another. Is that from growing up in a poor, small town?) Dodge was absolutely determined to win this game. Not for the money and prizes exactly, but so that he could claim his revenge once and for all. I thought that it was interesting that neither of these characters wanted to rely on anyone, but they each found someone to depend on, someone to help them through, for the most part. The plot for the book was very interesting and realistic. It’s something that I could see teenagers doing in real life. I was super curious all throughout the book to see what the next challenges would be, and to see who would end up winning the game. The book was a quick read, and definitely kept me turning the pages. Some parts of the book were super intense, and the tension almost drove me crazy. It was great! Overall; this book was definitely not what I expected, but it was a pretty exciting ride nonetheless. I really love reading Oliver’s writing. I still need to read Before I Fall, and I can’t wait to see what she comes up with in the future. I'm already rooting for Heather, who sounds like a bit of an underdog at the beginning. Dodge, too, though revenge isn't always the best motivator. I have loved everything that Lauren Oliver has written, and I can't wait to read this book! It sounds so exciting and interesting. Great review!